This post will focus on the second issue of the WOW Comics, printed in November 1941, part of the Canadian Whites Collection. In this issue three main stories are: Dart Daring and Perils at Sea , The Ring of Death and Whiz Wallace and the Kingdom of Awe. Out of these three two super hero stories that continue into the issues to come. Alongside the main stories there are interactive games and contests. For example, a drawing contest with the winning prize roller blades. This comic issue also holds, insight on the “Science of Wrestling” as well as war flags and fighter planes. On first glance, the comic seems to be a fun escape for children during the war, but the WOW Comics second issue can be seen as an instructional manual for both young boys and girls in the 1940’s. In the mid 18th and early 19th century, the Romantic period, the child came fully into its own as the object of increasing social concern and cultural investment; which in turn brought a new genre into writers’ attention, children’s literature. The previous belief was the Puritan belief, that all humans are born sinful as a consequence of mankind’s ‘Fall,’ which led to the notion of childhood to be a perilous period. From around the middle of the 18th century, many people in Britain began to think about childhood in new ways. Philosopher Jean-Jacques Rousseau is one of the architect’s whose work rejects the doctrine of Original Sin and maintains that children are innately innocent, only becoming corrupted through experience of the world in Émile, or On Education (1762). Following Rousseau’s lead, romantic poets such as William Blake and William Wordsworth, childhood became close to God and a force for good. Both Blake and Wordsworth work with the suggestion that the “child-like state of innocence [is] morally and emotionally superior to the condition of adult experience,” (Benziman, 69). Childhood was now associated with nature, innocence, the unconscious, most instinctual being. In children’s literature, the idealized version of childhood became prominent and remained enormously influential throughout the 19th and into the 20th century. The child like state of innocence is viewed as higher ranking to a condition of adult experience,” (Reynolds). Add to that this child-like state is rather artistically productive. However, not everyone saw childhood as a state to be hurried through in order to achieve adulthood. The 19th century saw the development of what is occasionally referred to as the “Cult of Childhood”, with adults delighted to celebrate childhood in texts and images. The connections with the Romantic ideal of childhood are clear, but many writers of the ‘Golden Age’ of children’s literature went further, even expressing a longing themselves to be children once more. But perpetual childhood is impossible, and there is a notable tendency in some of the best-known Victorian fantasies for child characters to die in this world in order to be reborn or to stay children forever elsewhere. The Cult of Childhood persisted into the 20th century, reaching its height in J M Barrie’s Peter Pan (who first appeared in a play of 1904), who famously refused to grow up (Reynolds). Working-class children were sent to work at an early age with the beginning of the industrial revolution, as it was a common belief that children should contribute to carrying on the industries of their country. This notion was of equal importance as education, urging factory owners to use children to their advantages. For example, using children in coal mines, as they were small enough to fit in the crawl spaces as well as they did not know any better. On 1 September 1939, German forces invaded Poland, and the Second World War began. Donald Macdonald, then a boy in Winnipeg and later a federal Cabinet minister, remembered huddling around the radio in his grandparents’ living room, listening to the CBC reports of the Nazi invasion. “Even as a seven-year-old I understood that the world had just changed for the worse,” (Canadian Encyclopedia). The six-year-long war brought changes to the world and forever altered Canada. Then a nation of only 11 million people committed more than one million men and women to uniform, (Canada War Museum). The adults started to disappear from children’s lives after the war started. Soon male teachers abandoned classrooms for service in the armed forces. “They went from men in civilian dress to uniformed heroes — and sometimes martyrs,” (Canadian Encyclopedia). While fathers and older siblings were away on duty, children were expected to help around the house. Young children were assigned new chores, anything from cooking to cleaning. Mothers entered the workforce in white or blue-collar jobs forcing older siblings to look after the younger ones. Later, young girls, sometimes around the ages of 10 or 12, were employed in positions such as “general housework” or baby sitters. These children were expected to do this as they balanced homework and other duties. Schools were plastered with posters encouraging students to do their bit. They were taught to avoid careless talk that might aid the enemy and to be on the lookout for spies, specifically Russian. Teachers taught lessons about the war overseas and Canada’s contributions to beating the enemy. Victory Gardens were encouraged, at school or at home, anywhere a free patch of soil could be found. Children planted seeds and tended to their vegetables. “Every bunch of carrots or canning of jam was portrayed as a blow in battling the Nazis,” (Canadian Encyclopedia). To further the war efforts recycling was also depicted as essential to the war effort. Paper and metal scraps were gathered in large salvage drives. Canadians were instructed to recycle and reuse. Nothing was to be wasted in the fight. Babysitting money and allowances went towards purchasing war stamps. The stamps were sold in schools and stores; children purchased each for 25 cents. Sixteen stamps filled up a $4 card, which was sent to the federal government. In return, the child received a War Savings Certificate worth $5, to be cashed in after the war, (Canadian Encyclopedia). Not all Canadian children were allowed to participate in the war effort. Canadians of German or Italian descent were teased, taunted or assaulted by other children at school and home.The victims sometimes fought back, insisting they were as Canadian as anyone else, but most slunk away to the shadows, not anxious to draw any more attention to their heritage, or firm the stereotypes portrayed in political propaganda. The war in Europe ended on 8 May 1945, and children were among the millions of Canadians who were swept up in the excitement. Most young people took pride in having done their bit, with their service marked by knitting socks, helping in the home or on the farm, having dirty fingernails from gardening, and collecting mountains of scrap metal for recycling (Canada War Museum). As a result of the Puritan belief much of the earliest children’s literature is concerned with saving children’s souls through instruction and by providing role models for their behaviour, (Reynolds). Children’s literature includes stories, books, magazines, and poems that are enjoyed by children. Modern children’s literature is classified in two ways: genre or the intended age of the reader. The late nineteenth and early twentieth centuries became known as the “Golden Age of Children’s Literature” as this period included the publication of many books acknowledged today as classics (Burke M. Eileen, 108). One of the engineer’s leading towards children’s literature is William Blake. His work in the Songs of Innocence and Experience illustrate and conceptualize the new image of the child that was formed in the romantic period. The content of these poems revolved around purity and the angelic child that falls into experience as they transition into adulthood. Blake’s work was printed in a two part series, the Songs of Innocence and the Songs of Experience. This formatting created a divide in the content that was considered acceptable for children, and what happens after they live and experience. For example, the introduction to the Songs of Innocence illustrates the differences between the boy in the cloud and the piper who is tainted by his experience. As mentioned earlier the second issue of the WOW Comics can be seen a piece of literature that sets examples for children during the war time. With all the changes to their daily routine the children lacked the knowledge on how to accomplish what is expected of them. The ban on the importing of comics from the States allowed Canadian artists and writers to really gear the content towards the expectations of Canadian children in the 40s. The content of the Canadian Whites is specially geared towards the new image of the child surfacing during the war. Legault, E.T. (w). 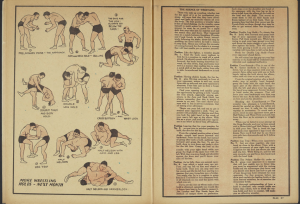 “The Science of Wrestling.” WOW Comics, no. 2, November, 1941, pp. 31. Canadian Whites Comic Book Collection, 1941-1946. RULA Archives and Special Collections, Ryerson University, Toronto, Canada. of the movement and learning to fight is giving them a leg up in the fight. They now felt prepared to tackle whatever enemy came into Canada, or when they themselves were fortunate enough to fight overseas. On the other hand, young girls were taught how to be submissive girls, calm and subdued. Legault, E.T. (w). 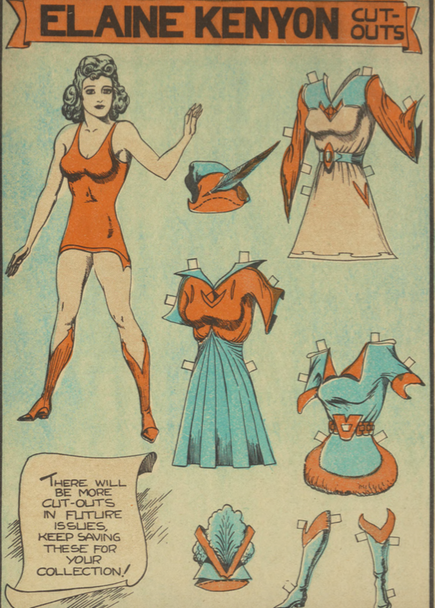 “Elaine Kenyon Cut-outs .” WOW Comics, no. 2, November, 1941, pp. 30. Canadian Whites Comic Book Collection, 1941-1946. RULA Archives and Special Collections, Ryerson University, Toronto, Canada. Elaine Kenyon Cut-outs: On the page there is a female dressed in an undershirt with calve length boots, in red. And there are three dresses, 2 styles of hats and a pair of boots. A young child can cut them out and dress up the doll in various ways, and there will be more outfits in issues to come. Young females were basically told they do not need to learn to fight because the boys already know how, they just need to relax and let the men do the saving. Young girls were employed as babysitters and they were encouraged to garden because that is all they could possibly accomplish. Legault, E.T. (w). 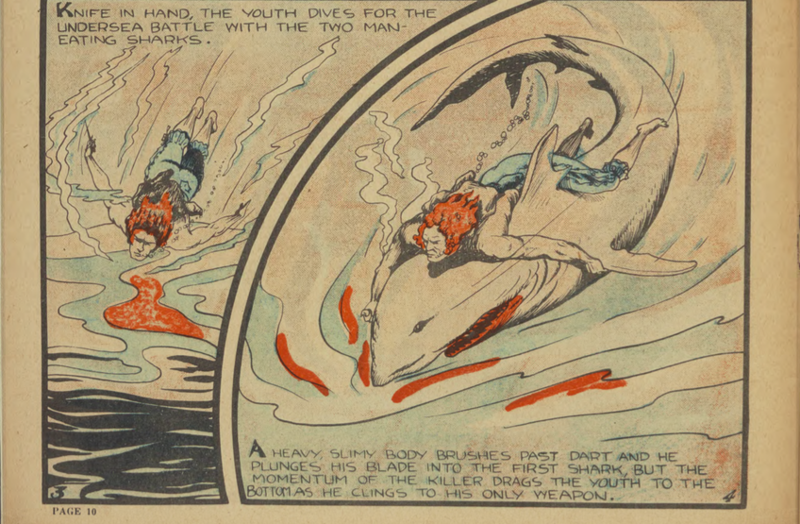 “Dart Daring and Perils at Sea.” WOW Comics, no. 2, November, 1941, pp. 10. Canadian Whites Comic Book Collection, 1941-1946. RULA Archives and Special Collections, Ryerson University, Toronto, Canada. experienced fighter. He takes on ever challenge thrown at him, whether it be wrestling sharks or seizing a ship all by himself. Dart is the example for what young boys should strive to be; the average man that can be a fighter and warrior. A heroic average man, ready to bravely tackle any enemy. 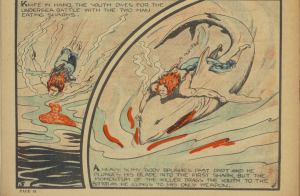 The content of the comics challenges the ideas of the ideal childhood introduced by Blake and other writers in the Romantic period. These comics present themselves as a binary to innocence and experience. The formatting of a comic book is considered equivalent to a picture book, but these comics tackle much greater political themes and questions. The child in the 1940’s was one of great responsibility and knowledge, as well as the duties of the home and contributing to the war. An advantage towards the war effort in whatever way possible. Benziman, Galia. Narratives of Child Neglect in Romantic and Victorian Culture. United States Of America: Palgrave Macmillan, 2012. Print. Burke, Eileen M. Early childhood literature: for love of child and book. Boston, Allyn and Bacon, 1986. “Canada and The Second World War .” Canada War Museum , www.warmuseum.ca/cwm/exhibitions/chrono/1931crisis_e.shtml. Accessed 31 Mar. 2017. Legault, E.T. (w). WOW Comics, no. 2, November, 1941, pp. 10. Canadian Whites Comic Book Collection, 1941-1946. RULA Archives and Special Collections, Ryerson University, Toronto, Canada. Reynolds, Kimberly. “Perceptions of Childhood“ WordPress.com. https://www.bl.uk/romantics-and-victorians/articles/perceptions-of-childhood, British Library. Accessed 15 Feb.2017.